Tuscany is full of touristic destinations, and especially many small towns (“borghi”) high on the hills that are really worth seeing, for all the things you can admire in each of them, and also the events taking place in them. Once you have visited the main cities, the great art cities, in Tuscany, my advice is that you reserve some days to visit at least some of the most beautiful small towns in the Tuscan countryside. In order to live in the best way, and appreciate, the slow and merry atmosphere of these small towns, the best choice is to stay in one of the many farm holidays or B&B in or near the town. Each of these picturesque villages still appears as in medieval times: a walled inner city, a Rock or fortress, or a castle, all rising high on top of a hill or a rocky cliff. But you won’t find just the Middle Ages in Tuscany: to live, even shortly, in these places is to make a leap into an even more remote past, the times of Etruscans and Romans, through the Renaissance up to the present day. What you cannot miss by all means is a quiet walk through the alleys and narrow streets of these small towns, stopping in shops and in little taverns offering typical cuisine and also snacks, to savour the best of the great Tuscan culinary tradition. Here’s a map of the 5 most beautiful small towns in Tuscany. 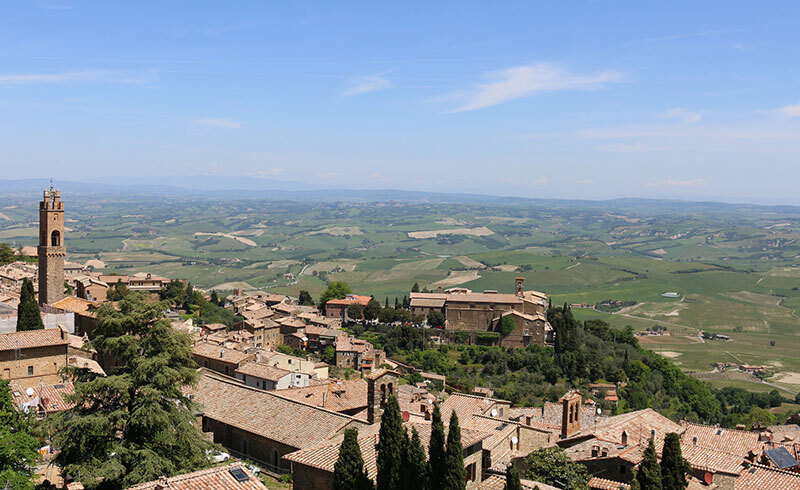 Perched high on a hill, surrounded by imposing walls from the thirteenth century, Volterra is one of the Tuscan small towns that will definitely take you backwards into the remote past. Within its very walls are ample relics of the Etruscan past – and there is an Etruscan museum you cannot miss. Then there is a Roman amphitheatre, and you can go onward, reaching the medieval Piazza dei Priori with the Town Hall, the Palazzo comunale, the Cathedral and the Baptistery. To follow this long historical path you’ll just have to walk leisurely through the narrow alleys of the town, where you can also discover the great craft of alabaster-working, in the many artisan workshops. Around you, the panorama of the “Balze”, the Crags, beautiful and somehow uncanny: these are vertical cliffs created by the erosion of water and wind, with deep ravines below. It is a wild and hidden corner of Tuscany what you see here. The best moment to appreciate this Tuscan small town is at twilight, with warm colours that soften the lines of the tufaceous rock on whose top the medieval village is perched, the lights shining in the old houses. On arriving, you will be welcome by the beautiful and imposing arches of the Acquedotto Mediceo. The town boasts very ancient origins, and, according to legends, it was founded by two Romans, and named after them. 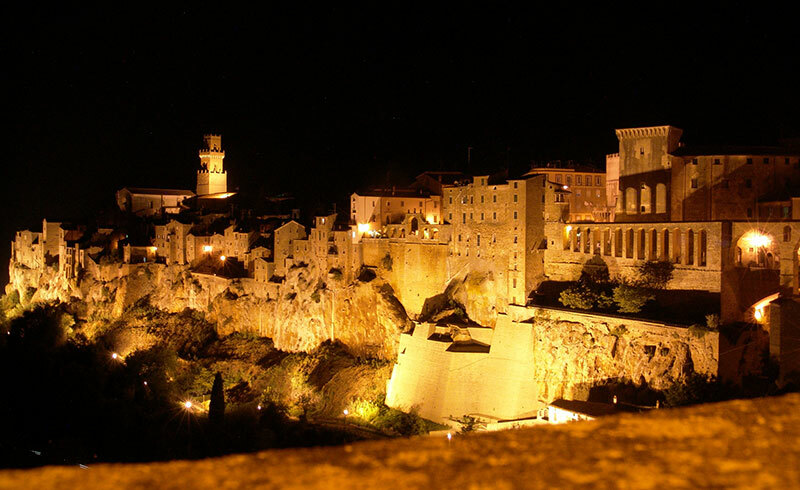 Pitigliano is a small country town in which cars are not allowed, so, in the evening, you’ll find old ladies sitting outside the doors of their houses, talking among them and enjoying the cool air. It’s a Tuscany that still follows the rhythm of nature. Taking a stroll through the streets and alleys of Pienza, near Siena, is like walking within a Renaissance painting. It is the perfect Tuscan town, perfectly proportioned and harmonious, exactly as it was thought by the great humanist, and Pope, Enea Silvio Piccolonimi: there is the Cathedral, the Pope’s residency (or Palazzo Piccolomini), the Town Hall, and the enchanting central square. This small town is a real jewel that dominates from the top of a hill the whole of Val d’Orcia, so that visitors enjoy a unique, breathtaking view. 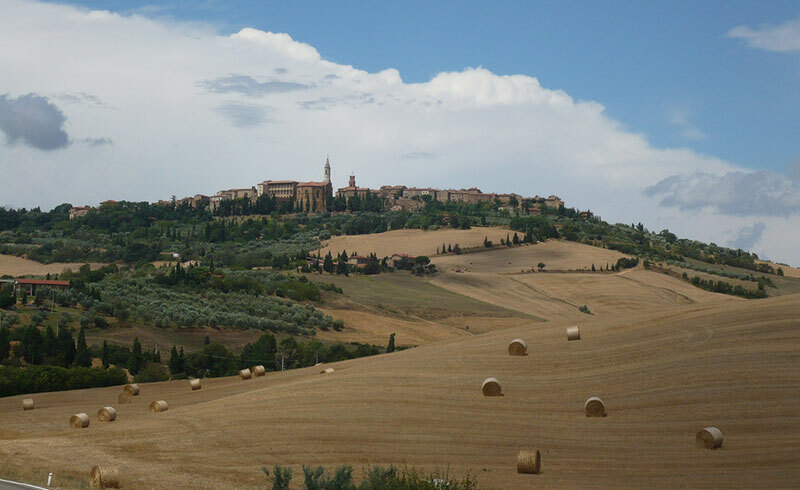 But Pienza is also famous for its excellent pecorino cheese (ewe’s milk cheese, the Pienza cheese), more or less strong and savoury according to seasoning. You will be able to do Pienza cheese tasting in one of the many little shops of delicatessen in town, maybe with the accompaniment of a good glass of Tuscan red wine. It is an absolutely “ideal” Tuscany, from all points of view! 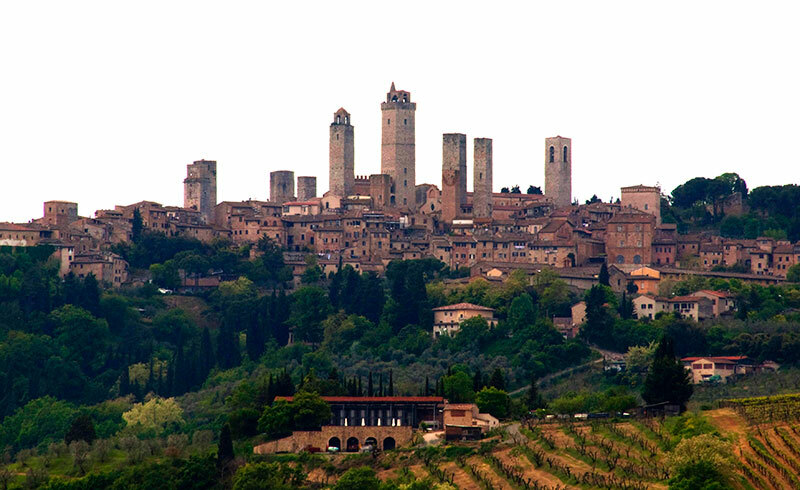 San Gimignano, also near Siena, and also a walled Tuscan city, is one of the internationally best known Tuscan small towns, especially, but not only, for its “thousand (medieval) Towers”. As a matter of fact, only 14 towers are left within the circle of the medieval walls, but it is likely that – in the old times when rival families struggled for power also by building very high houses – there were more than 70 towers within the walls. The walls date from the thirteenth century, and, within them, you’ll find a perfect image of the Middle Ages, preserved up to the present day in all its beauty. Its narrow alleys are overlooked by towers, case-torri (tower-houses) and palazzi, all once owned by the ancient aristocracy and by merchants and bankers. The narrow streets all converge on two delightful squares. The visitor should taste here the very best, and most famous, Tuscan white wine; the Vernaccia di San Gimignano, a wine with an intense and fruity flavour. Among those who praised this wine over the centuries were Popes such as Martino IV, men of letters as Dante Alighieri and Giovanni Boccaccio, powerful men of state as Ludovico il Moro and Lorenzo il Magnifico. 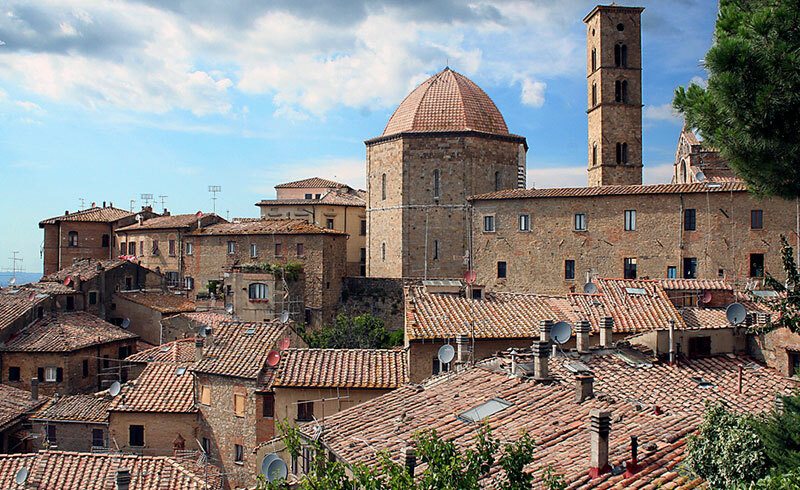 As in a fable, this small Tuscan walled town is preserved as if it were still in the sixteenth century. It is surrounded and dominated by imposing walls, and boasts a beautiful castle too. From these walls you can appreciate one of the best things of Montalcino, the great view of the Val d’Orcia, with green hills, cypresses, century-old oaks, fields of corn and poppies. Within the walls, Montalcino is perhaps most famous for its great Brunello di Montalcino, one of the world’s greatest red wines, a Tuscan red with the property of coming from only one species of grapevine, the Sangiovese, and of being aged in oak bottles for three years at least. A perfect choice to accompany traditional Tuscan cuisine. 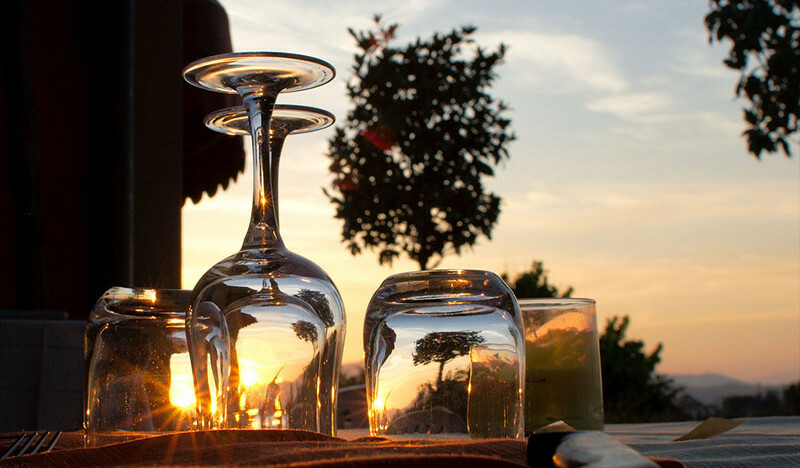 There are many typically Tuscan wineries where you can try wine tasting.